Belt drives are a popular choice because they require no lubrication and minimal and infrequent maintenance. Belts dampen sudden shocks or changes in loading and offer quiet and smooth operation. 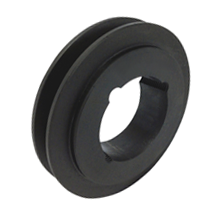 Pulleys are usually less expensive than chain and exhibit little wear over long periods of operation. We have the biggest range of belts and pulleys in the Geelong region to fore fill all your drive requirements.